back To The Classics The Contour Mouse Has Been Our Flagship Mouse For Over 20 Years. Now You Can Enjoy The Same Benefits Of The World''s Finest Ergonomic Mouse With A Newly Designed Scroll Wheel And Thumb Rest, All New Cursor Speed Selections And A State Of The Art Sensor For Added Precision. 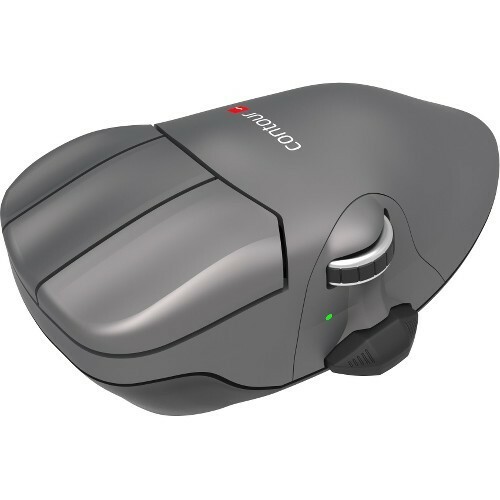 The Contour Mouse Is Available In Three Right Handed Sizes (s, M, L) And Two Left Handed Sizes (m, L), So There''s A Contour Mouse For Just About Anyone. Made For You. A Pronounced Arch On The Top Of Contour Mouse Supports Your Hand From Underneath, Allowing You To Rest It On Top Of The Mouse. Elongated Buttons Allow You To Use The Second Knuckle Of Your Finger To Click, As Opposed To Micro Movements Associated With Clicking From Your Fingertips. Contour Mouse Offers A Proper, Full-size Third Button For The Double Click Function. Your Thumb Rests Naturally On The Side Of The Mouse, Between The Scroll Wheel And A Rocker Switch. Contour Mouse Is Optimal For Localized Injuries To The Wrist And Hand And Allows You To Move The Mouse With The Full Lower Arm. Technology Moves Fast, But Our Hands Don''t Change. Three Right Handed And Two Left Handed Sizes Ensure That You Will Find A Contour Mouse That Fits Your Hand Perfectly. This Prevents Behavior That Can Aggravate The Hand And Wrist, Which Can Result In Repetitive Strain Injuries (rsi). When You Find The Mouse Size That Truly Fits Your Hand, You Increase Both Comfort And Control. The Right Angle. Our Design Team Concluded That A Slight Pronation Angle Of 17 Degrees Was The Perfect Balance Of Ergonomics And Productivity. The Neutral Tilt Of Contour Mouse Relieves Pressure On The Forearm, Opening The Carpal Tunnel While Minimizing Grip Force. Find Your Size. Your Hand Should Be Able To Rest Upon Contour Mouse And Support Your Full Palm From Underneath. To Find Your Perfect Size, You Should Measure The Length From The Tip Of The Middle Finger To The First Crease Of The Wrist.